This 3-point sling that holds your weapon close to your torso that just happen to be the most comfortable position for just carrying it around. However, when you suddenly find yourself in close quarter combat and need maneuverability, you may want a single point sling. No worries, it has a quick release mechanism to quickly transform it. Our IDF 3-point rifle sling uses an advanced 3-point system that allows you to carry your gun in several different positions and provide the ability to transfer quickly from one to another. This system makes it easy to transform your rifle between shoulder carry and back carry, as well as enabling you to quickly and easily switch from standard 2-point style position to 1-point close quarters position. Unique QR (quick release) buckle design on the sling allows for simple, yet secure attaching and detaching of your gun and switch positions. When not in the combat situation this sling will secure your rifle in a neutral, muzzle downward angle for added safety, and allow quick transformation into combat position. This tactical sling features a universal design that makes it compatible with big variety of rifles/guns. 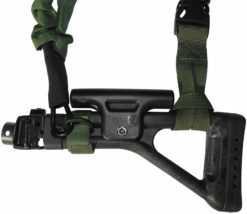 When this sling connected to front and rear points of the gun, it can be used as two or three point sling, and gives option using QR (quick release) buckle to transfer to one point sling connected only to the rear part of the gun. With modern sling design some slings can transform from two-point to one-point sling under 1 second as this possible with our three-point slings that was developed when the soldier needed to reach his side arm without wasting time and keeping his primary weapon secure. This three point gun sling is also fully adjustable to allow for the best fit possible and is made of heavy duty nylon webbing for maximum durability. The IDF 3-point quick release sling is long enough for most applications and will hold the weight of heavy rifles with its accessories. With all the experience and wisdom, we’ve discovered that soldiers need to have complete command of their weapon and still be able to use their hands for other tasks. The solution was to give combatants a third hand and thus the 3 point sling was developed. 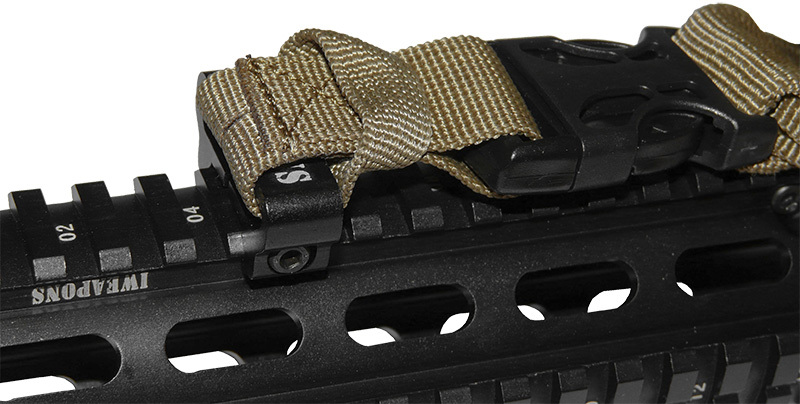 The design of this sling allows for hands-free operation while maintaining quick access to your rifle. The transformation time from being torso bound to a one point sling for a crowded battle is less than one second. Improvements never stop at Israeli weapons and this sling is a great example of that. This 3 point sling is simply ingenious. It gives you all the benefits of 3 different sling types in one. The sling has one strap that coils around the torso, one for the front and one for the rear of the weapon. This secures your firearm close to the body for ultimate comfort and allows the rifleman to be hands free. The 3 point sling keeps your rifle quick at hand and allows it to rest muzzle down for safety while keeping the barrel dry and clean. This position also permits rapid shift to a firing point. Many people use the straps to reduce movement and improve their aim. If a situation arises calling for close combat it quickly transitions into a 1 point sling by way of the quick release buckle. It can transform into a 2 point sling and back to a 3 point sling in less than 1 second. Competing slings may offer 2 point to 1 point conversions, but not all three solutions. You can carry it secured to your body, over your shoulder or slung over your back. This tactical sling is long enough to wear over the normal tactical gear and sturdy enough to bear the weight of heavy rifles. The nylon web of the sling is made of the highest grade for longevity. It’s easily adjustable for customization, to match your size and comfort and available in three main colors– black and green and tan. 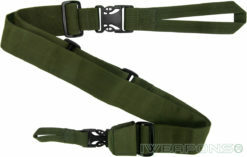 Rifle slings are an important tool in combat as well as many civilian activities. Hunters in particular like the hands-free advantage for other tasks such as dog handling or bird calling. Another group that appreciates the advantages of this sling is the riot police. This sling can be held in a safe position while staying secured to the body. Military training camps and police academies teach newbies on how to use the sling properly and how it can be manipulated to promote steady aim. It can also be wrapped to help absorb some of the reverberation when fired.